When we talk about sustainability its essentially a conversation about the ability to keep doing what you want to do. Its that simple. When we look around for inspiration there is no better example in our neck of the woods than Liffey Wanderers Football Club, an institution thats been in existence since 1885. Founded by boat-hands and dockers, Liffey's, as they are lovingly known, outdate other footballing giants around Europe such as Liverpool, Real Madrid and Juventus to name but a few. As part of our Sustainability Programme we wanted to find ways to support the local community in an active way and our good friend Ian Kelly suggested we come on board with Liffey's, a locally based football team who are making massive strides in Irish Football. What we didn't quite expect was the depth of history that this club behind it . One of Liffeys' most famous sons is undoubtedly Patrick O'Connell, a man who was born on Mabel Street in 1887 and had a distinguished career in the UK playing for clubs like Manchester United, Sheffield Wednesday and Hull. He also captained Ireland and won 6 caps and the British Home Championship along the way. When his playing days came to an end he took up management and soon made a name for himself in the La Liga in Spain, taking control at Racing Santander, Real Oviedo and Real Betis but he is best remembered for his next appointment in 1935 as manager of perhaps the worlds greatest football club, Barcelona. During his time as manager here he brought the club on a tour of America that was widely heralded as an initiative that saved the institution from financial ruin. So revered is he in Real Betis that they erected a bust of him outside their stadium to commemorate their one and only La Liga title win under his stewardship. The Club has been part of the fabric of the city for many decades now and is even mentioned in James Joyce's Ulysses. They're based in Ringsend Park in Irishtown, a stones throw from the birth place of two of the countrys' footballing giants, Shelbourne and Shamrock Rovers, though both clubs have now moved else where in the city. They won the Empire Cup three times in a row between 1904 and 1906 and were allowed keep the trophy to commemorate this, and today it sits in FAI headquarters on permanent display. 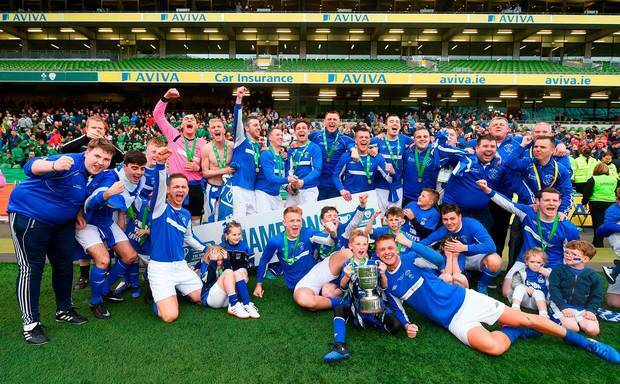 In 2015 the club won the FAI Junior Cup and in 2017 they won the FAI Intermediate Cup. They're currently competing in the Leinster Senior League and have done a great job of developing local talent with very little resources. Today they play their home games on an all-weather 4G pitch but due to heavy competition for spots, the cost of renting pitches has become increasingly expensive over the years. As more and more companies open in the Docklands and South City areas of Dublin, the demand for recreational spaces increases, so Liffeys' have found themselves competing for slots with the tech giants and corporate workers who are also looking for a kick-about after work. So this year we've stepped in and will be paying the rental fees for the team so they can continue to train in Pearse Park on the 4G pitches and hopefully continue the success they've seen in recent years. We're looking forward to supporting the club for many more years to come and will be posting more about their progress in the coming months.